Inspired by the idea of anarchy, we designed this free WordPress theme for your personal blogs and diaries. This theme is perfect for writers and artists. 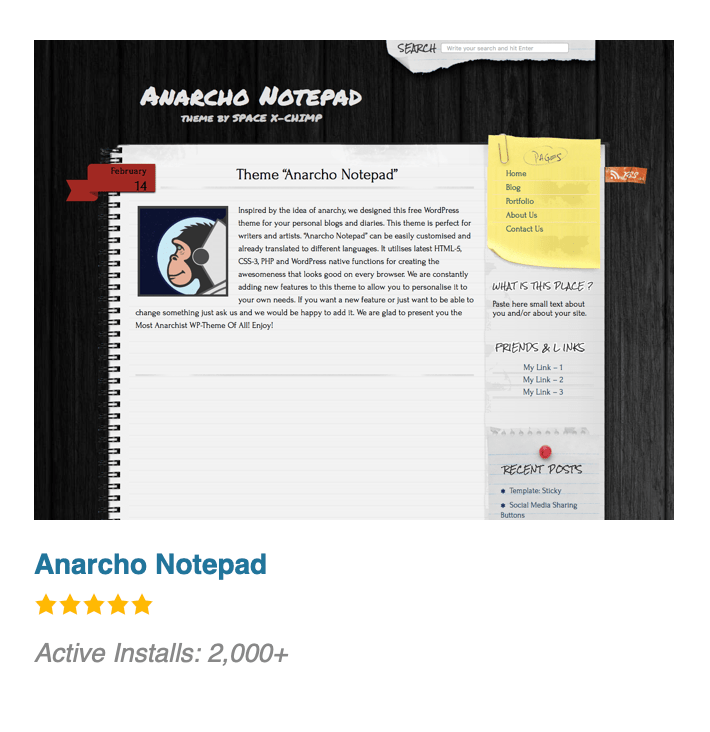 “Anarcho Notepad” can be easily customized and already translated to different languages. It utilizes latest HTML-5, CSS-3, PHP and WordPress native functions for creating the awesomeness that looks good on every browser. We are constantly adding new features to this theme to allow you to personalize it to your own needs. If you want a new feature or just want to be able to change something just ask us and we would be happy to add it. 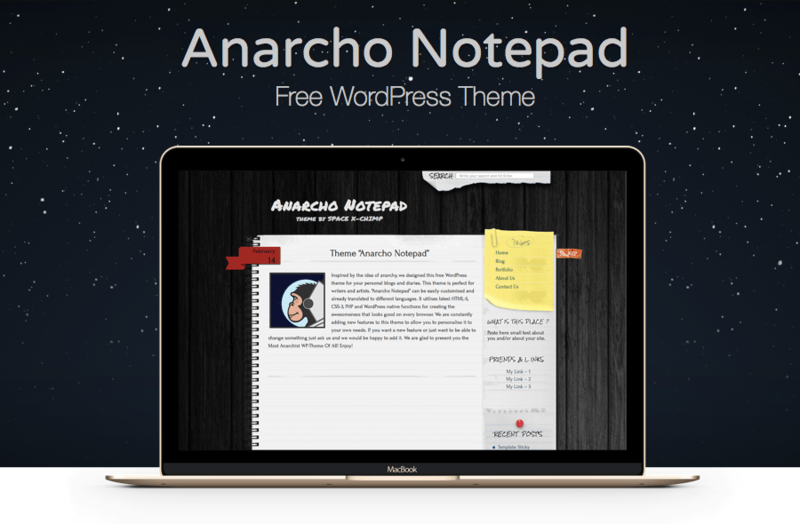 We are glad to present you the Most Anarchist WP-Theme Of All! Enjoy! This theme is used simultaneously by more than 3.000 people worldwide! In the theme “Anarcho Notepad” is used several images from theme “Notepad Chaos v2.0” by Evan Eckard. A list of these images: notepad-middle.png, yellow-sticker-middle, yellow-sticker-bottom, white-sticker-top, white-sticker-middle, white-sticker-bottom. 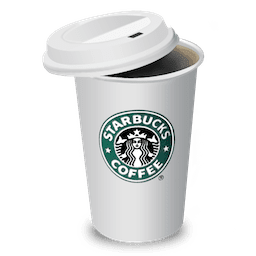 This theme is open-sourced software licensed under the GNU General Public License, version 3 (GPLv3) and is distributed free of charge. You can read more about child theme in the Codex. We are pleased to inform you that now available two premium versions of this theme, they are called the “Authors Notepad” and “Simple Notepad”. Both are optimized for mobile devices (they has a responsive and mobile friendly layout). The Author’s Notepad theme has the same design, but much improved. Also it has a new cool features, such as an options in customizer for change the text of following inscriptions: “Search”, “Pages”, “What is this place”, “Friends & Links” and “Recent Posts”. You can learn more about it here.